So, no, we have no news. It's been a strange couple of weeks for rumors...lots of speculation that things could speed up or slow down...quite helpful, really. :) I've been crunching some numbers, and I'm hopeful that we could see a referral by the end of 2008, but I wouldn't bet on it. I couldn't make this up if I tried! It does seem like cookies love me just as much as I love them! Getting very excited for the start of game 1 of the World Series...GO RED SOX!!!! 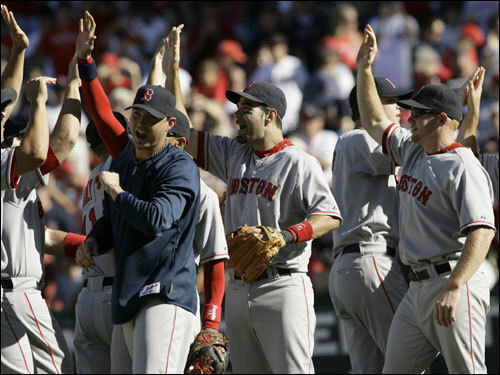 On a much happier note, the Red Sox are headed to the ALCS after a dramatic sweep of the Angels. I celebrated t he win of the AL East with my Uncle Stan - we watched together over the phone, and it was a phenomenal night. Then to watch the Sox come out so strong against a really good Angels team? Well, let's just say it feels a lot like 2004. I'm cheering for the Indians right now, partially because Shana is such a big Indians fan, but mostly because I can't wait to see the Yankees go out in the first round. I guess $195 million just doesn't go as far as it used to. And for those of you who are bound to tell me just how inflated the Red Sox payroll is...yes, it's absurd. But the difference between the Yankees and the Red Sox payrolls is greater than the entire payroll of the Diamondbacks (who are also in the playoffs), Pirates, Nats, Marlins, and Devil Rays. Crazy, no? Regardless of who we play, I can't wait for Friday night!